In the last years, airports have undergone a structural and conceptual transformation, which has originated from new consumer behaviours of users travelling for business or pleasure, thus changing from simple transit places into multipurpose places. As proof of this, there is the increasing offer of services provided by many airports in order to give a more experiential dimension to the concept of travel, thanks to the presence of shops, restaurants, gyms, wellness centres and waiting lounges. These latter spaces play a key role in offering to the travellers a discreet place, separated from the flow of people, who every day crowd the check-in and departure areas. The high ceilings, the smooth reflective surfaces and the functional and minimal furniture contribute to create an uncomfortable environment from an acoustic point of view with high reverberation. Caruso Acoustic has understood this problem and has developed a solution to improve reverberation times in airport lounges. Flag sound-absorbing panel has been specially conceived to act as a flag, which can intercept both direct and reflected sounds. In this way, an interruption of the volumetric wave and a reduction of the acoustic reverberation can be obtained. 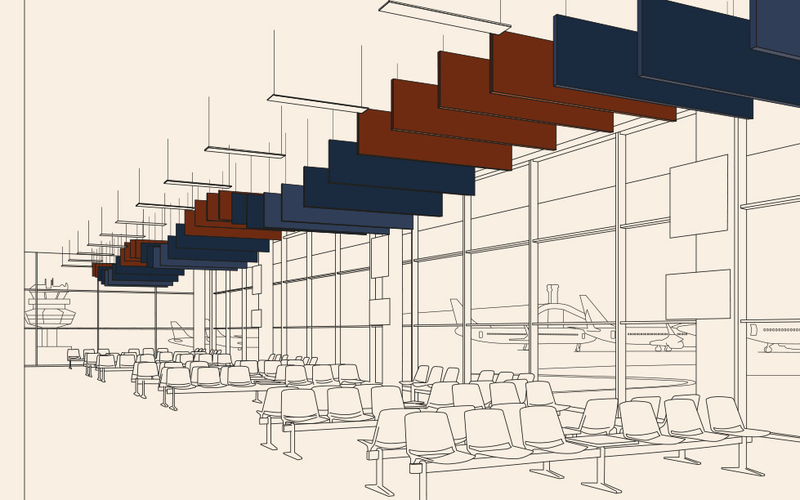 The proposed project of acoustic correction concerns two airport lounges of about 400 and 600 m³. The frequencies considered are those concerned by the speech, 250-2000 Hz. Given the volume of these spaces, the best average Reverberation time (RT) is of 0.75 s.
In the smallest room, the reverberation time before the intervention was of 2.64 s at an average of 250-2000 Hz, therefore inadequate to guarantee a relaxing and comfortable place to travellers. Thanks to the installation of 36 Flag panels of 240x60x5 cm, namely a covering of 36,5% of the ceiling total area, it is possible to achieve an average RT of 0,75 s. Regarding the biggest room, instead, the reverberation time before the intervention was of 2,62 s at an average of 250-2000 Hz. With the installation of 48 Flag sound-absorbing panels of the same dimension (covering of 50% of the ceiling total area), it is possible to reduce the average Rt to 0.76 s, thus obtaining a result fully in line with the fixed target. As illustrated in the graphs, in the first room we can see a reduction of the sound level of 5.41 dB; in the second room, the reduction is of 5.37 dB. Thanks to the technical features of the product, Flag panel can meet in the best way specific project needs and offer the possibility of creating high-impact, dynamic volumetric effects during the installation. In addition, there is a most recent innovation: the integration of a visible linear LED lighting system placed along the entire length of the panel. This integration enables to light up the whole room surface area thanks to the double function of the product.